It all started in 2001 when Danny and his father Buck went zip lining in Costa Rica. They instantly knew it was a fun, environmentally friendly activity that could take off on Maui. Skyline Eco-Adventures was instantly embraced by the locals and visitors. 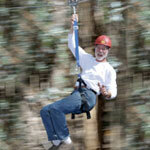 Their company has been so successful that in 2007 they opened another zipline tour above Ka’anapali. According to Danny, a huge part of their success comes from caring for the planet. Throughout the tour, zippers are educated about Maui’s ecology, learning about indigenous and invasive s pecies of flora and fauna. A percentage of all sales is donated to the protection of Maui’s environment. They also practice active recycling, and are the world’s only “Carbon Neutral” zipline operator; offsetting all their vehicle, store and office emissions by paying for carbon offsets. This money actually goes towards creating new renewable energy projects across the country. For a locally owned business on Maui, that says a lot. Danny and Buck Boren are clear proof that green is great for the planet, and for success in business as well! We went out and ziplined for ourselves to see if it really was as great as Danny said. Our conclusion: Wow! It was a fantastic experience; fun, educational, easy, and thrilling. When asked what their secret to success is, Danny said “To provide a safe, fun experience at a great price and keep giving back.” With over 1,000,000 customer zips over the last 11 years, and tours both on Haleakala and in West Maui, they must be doing it right. 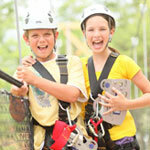 For more information or to book a tour, call 808-878-8400 or visit their website (and get a discount) at Zipline.com.